Wells - 43 Easter eggs will be spread around the shops of Wells, each having a letter associated with it. The 43 letters, when collected, will form a sentence about Rotary. Leaflets will be available in the shops participating. Bridport - President Chrissie invited members and friends to celebrate the end of her year in office. The speaker Kate Adie a patron of Hope and Homes for Children and famous journalist and foreign correspondent talked about her career and Hope & Homes for Children. Chard - A 3 course Sunday Lunch in support of Rotary's Polio Plus campaign. Glastonbury & Street - The Band of the Royal Marines Collingwood entertained at McMillan Theatre, Bridgwater. Tickets from McMillan Theatre. Midsomer Norton & Radstock - Burns Night Celebrations at Farrington Park Golf Club. Enjoy the spectacle of a true Burns Supper Celebration with three course dinner (Haggis, with beef option), Piping in the Haggis, Address and Salute to the Haggis by our President. Bridport - We had a real fun evening last night against the Yeovil Rotary team at The Admiral Hood, In Mosterton in the Plate Competition. Bridport - President Chrissie and Rotarians from Rotary District 1200 attended the opening ceremony. Wells - The annual Reindeer Parade and associated children's competitions take place in the town's High Street. Sat 08/12/2018 - “Rotary in Action” working hand in hand with organisations to make a difference in your local community. Bridport - The Town Hall clock will be illuminated purple and collections will be made for the Purple for Polio campaign to eliminate polio worldwide. Chard - Chris Walker and the Pedigree Jazz Band present their Salute to Trad Jazz - St Mary's Church, Chard - Tickets £12.50 to include light refreshments and coffee / tea. Bring your own drinks. TICKETS ARE LIMITED SO DON'T LEAVE IT TOO LATE. Glastonbury & Street - Two Rotarians travel to Henstridge to present a cheque for the proceeds of the Charity Golf Day held earlier in the month. Dorchester Poundbury - The first fundraiser (for the DCH Cancer Appeal) for the new Rotary year is on September 7th at the Brownsword Hall, Poundbury starting at 19.00. One of the club’s slightly different quizzes! The previous quiz sold out...... so get in! Thursday 6th September at Wheathill Golf Club. The lead charity this year will be the Dorset and Somerset Air Ambulance. Wells - Last year raised almost a thousand pounds through a series of pop-up shops for the local charity, Heads Up. The club will continue to support this valuable charity with this year's pop-up shops. Sun 26/08/2018 - 2018 Dinnington Ride Cross Country Equestrian event. Crewkerne - The 2018 Dinnington Ride will be held on Sunday 26th August, starting between 9.30 and 11.30, from a field near Dinnington Docks. Bridport - At Melplash Show the Club promoted Rotary, the Trick Factory and our Business Partners. We displayed the Trick Factory banner and inside a film was shown on a large tv screen. Purple for Polio pins were on sale and a Shelterbox was displayed. Yeo Vale - Members from Yeo Vale, Sherborne Castles and Brue Valley Rotary Clubs will be assisting again at Sherborne Castle with the Classic & Supercars Show on 15th July. This event has raised over £130,000 for charity in the past 4 years. Sherborne Castles - 2000+ Classic, Supercars, Veteran, Rally, American, Custom, Hot-Rod and Special cars, together with 40+ car clubs, all in the magnificent grounds of Sherborne Castle. Crewkerne District - Find out about the fun working on great local projects and to meet new Rotary friends please come along to one of our bar-and-nibbles social events. Wells - A special one-man show, by Peter Gilchrist, of the Wit, Wisdom and World of Oscar Wilde, performed as part of a fundraising evening for the Indian charity Reaching The Unreached, in the Wells Little Theatre. Frome Selwood - An Interact Club based at Frome College has been chartered, by the Rotary Club of Frome Selwood, The picture was taken at the "chartering" of the club at Frome Town Hall by Stewart Cursley (District Governor). Dorchester Poundbury - A race night, your chance to win - or lose! Charity bar, and the £8.00 a head includes food during the evening. On 11th May, doors open at 19.00 at the Brownsword Hall, Poundbury. Booking essential as our last two events sold out. Chard - An evening of celebration featuring the music of the Phoeniix Brass Band. Bridport - The Dorset police choir will be joined by local soloists Kerren McAlister and John Follett. Brit Valley - Saturday 14th April 2018 at Salwayash Village Hall, from 19:30. Entry £5.00 to include a Cheese and Wine Supper. Press details button for the result of the Auction. Ottery St Mary Parish Church. Wells - Sunday 3rd December 2017 Rotary's Annual Reindeer Parade with real Reindeer pulling Santa's sleigh from Wells Market Place around the streets of central Wells and back. An excellent family day. Glastonbury & Street - We provide a reserved seating area with chairs for disabled spectators. D 1200 Rotarians with a golf handicap are invited to enter the District Competition. Registered conference delegates only will be eligible for the conference trophy. Dorchester Poundbury - Curry night at the Spice Centre (37 High West Street) on the 20th September. All you can eat buffet for £15 a head. Profits in aid of the Rotary Nepal School Project. Dorchester Poundbury - This one of the club's regular quiz nights, but as always with a twist. Nibbles will be on the table, and there is a cash bar - the profit going to the Dorchester Opportunities Group (and Rotary Charities). Glastonbury & Street - The Annual Charity Golf Day at Wheathill Golf Club supporting Childrens Hospice South West and other Rotary charities and District 1200 golf competition. Glastonbury & Street - Members enjoying an evening of croquet at The Bishops Palace, Wells. Wells - Come and Join us for a great family day out playing a friendly game of Boule with the local (and international) community and enjoy a lovely breakfast, buffet lunch and a glass of Pims to keep your energy up. This years handover will take place during "high tea" at the Swan Hotel in Wells. Come along and meet our competition winners from around the district. Mon 29/05/2017 - Dorset Cream Tea at the Salt House, West Bay at 2 pm. Bridport - Cost £4.00 and £5.00 each according to the number of scones. An historic looped film presentation of Bridport Harbour will be run continuously in the hall. There will be book and tombola stalls, a best scone competition and Maypole dancing. Glastonbury & Street - Members gathered to celebrate 70 years. District 9700 NSW Australia: There is still some availability on the District 1200 team. Melksham - Come and see the crocus display as they start to emerge at St Michaels Churchyard, Melksham. Kings of Wessex School, Cheddar. Rotary Youth Leadership Awards (RYLA) is a training programme for leaders and potential leaders and is one of the most successful Rotary programmes run by Rotary clubs around the world. Has your club considered running the Young Photographer competition? Glastonbury & Street - Mary Berry chatted with Claire Carter from BBC Radio Somerset. The event raised funds for the Avalon School Hydro-Therapy Pool. Paul Harris Awards were presented to Mary and her brother William. Your club will shortly be receiving voting forms to select certain officers for the Rotary year 2017 - 18. Brue Valley - A talk by Kate Aide at North Cadbury Village Hall folowed by a meal at the Catash. Booking essential. Glastonbury & Street - Results of the great competition at Wheathill Golf Club on Thursday 8th September 2016. Somer Valley - The 10th Wessex Beer Festival at our brand new venue in Chilcompton was a great success with a fantastic selection of beers and ciders and some fine live bands on stage. Melcombe Regis - Dragon Boat competition held in Weymouth Bay with a great deal of help from the brilliant guys 'n gals of PGL, Osmington Bay. Cost Â£150 per boat, team of 14 - 20 paddlers. Team members encouraged to raise sponsorship. Glastonbury & Street - Members enjoy a evening of croquet at The Bishops Palace in Wells. Bathavon - Bike Bath is an annual cycling event in which supporters of Bathavon participate to raise funds for charity. The nominated charirty for this year is Bath Rugby Foundation. 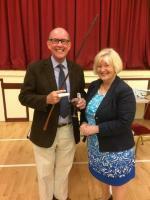 Bridport - Clive Jeanes will handover his Presidency to Roger Stoodley. Roger's nominated charity will be Bridport Charity The Living Tree. Sherborne Castles - Annual event held by the Rotary Club of Sherborne Castles. Glastonbury & Street - The Big Day Out 2016 Wednesday 8th June 2016 The first Rotary KidsOut Big Day Out took place in 1990 and since then we have taken up to 25,000 disadvantaged children on a fun day out every year. Calne - Charity Classic Car Run through the picturesque Wiltshire countryside with optional lunch or pic-nic at the Atwell-Wilson classic car museum in Calne.